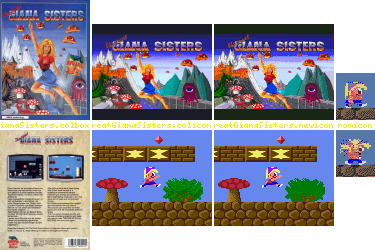 That patch applies to Great Giana Sisters (c) 1988 Timewarp/Rainbow Arts. You need 512 KB ChipMem (+890 KB OtherMem for preload option). - Fixed: Gfx-problem with the flame. saved (except you used the trainer). BoxIcon has been made from boxscans (http://hol.abime.net/2793). Psygore in 2006, 2012, 2013, September 2018.